Eddy Senior Living Communities – a division of St. Peter’s Health Partners- offers independent living, enriched housing/assisted living and innovative memory care community for seniors. Designed using conversion rate optimization, leads increased 53% after the site was launched! Finding the right senior living community can be a major decision for seniors and their caregivers. 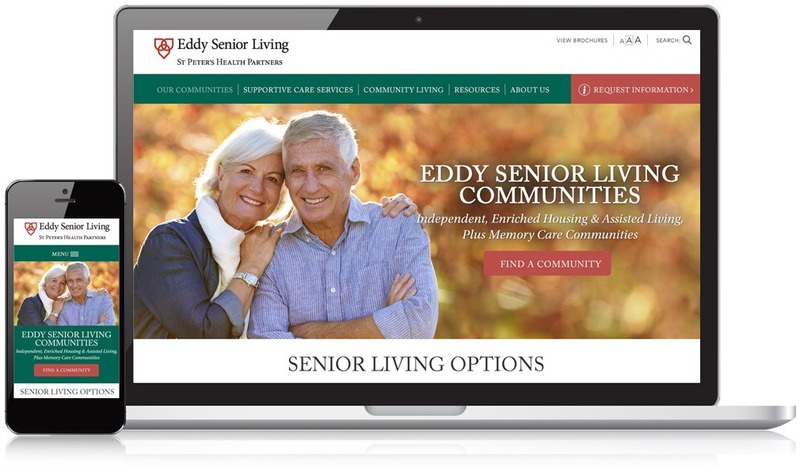 To bring ease to this process, the Eddy website creates a warm and inviting feel using rich colors, friendly images, and compelling copy that introduces visitors to their senior living communities and guides them in the right direction. We also reorganized the content on the website to provide a better flow and to help visitors quickly and easily find the most important information for their needs. The website is designed to foster a dialogue with visitors and encourage them to request more information about the senior living communities that best match their needs. With so many senior living communities to choose from, visitors can get a quick overview of each community without feeling overwhelmed with information. We developed modern layouts featuring ample breathing room around the content to give visitors a snapshot of the many senior living communities. From here, prospective residents and caregivers can click-through to community landing pages where they’ll find more details about each community.